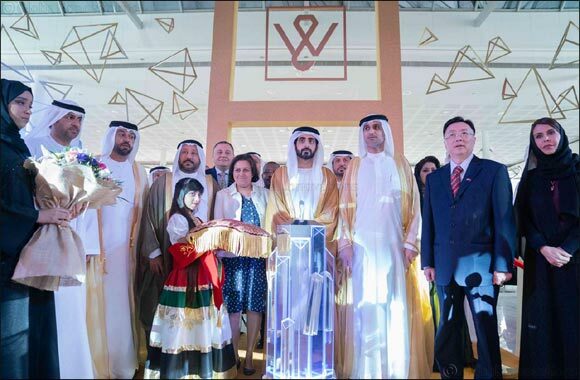 Sharjah, April 2, 2019: Cementing the credentials of the UAE as a global jewellery hub, the who’s who of the industry from across the world have descended on Sharjah for a key consumer and trade event that has got under way at Expo Centre Sharjah on Tuesday (April 2, 2019). The 46th Watch & Jewellery Middle East Show was inaugurated by H. E. Sheikh Salem Bin Abdul Rahman Al Qasimi, Chairman of the office of His Highness the Ruler of Sharjah, in the presence of senior government officials, SCCI board members, diplomats, jewellery executives and industry representatives. Held under the patronage of His Highness Dr. Sheikh Sultan bin Mohammed Al Qassimi, Supreme Council Member and Ruler of Sharjah, the event will continue until Saturday (April 6, 2019). The opening ceremony was also attended H.E. Waleed Bukhatir, Second Vice-Chairman of Sharjah Chamber of Commerce & Industry, H.E. Saif Mohammed Al Midfa, CEO of Expo Centre Sharjah, and H.E. Mohamed Ahmed Amin, Acting Director-General of the SCCI. According to multiple international consultancies, gold, which traded near US$1,300 an ounce in March, is set to climb higher to US$1,400 an ounce by end of next year, offering shoppers a great opportunity to take advantage of the Market condition. “Thanks to the continued growth of the Watch and Jewellery Middle East Show, the event has become the first and foremost choice for globally jewellery majors to cater to the region that has a strong penchant for luxury goods. This time too we have strong participation local as well as international names, offering a great opportunity for both the trading community and general buyers,” said H.E. Al Midfa said. For its 46th edition, the show is featuring more than 500 master jewellers from more than 20 countries at 30,000 sq m of premium exhibition area, showcasing latest trends in gold and diamond jewellery from across the world. Exhibitors from Canada are participating for the first time in the show. Right after the inauguration ceremony, hundreds of visitors thronged the stalls, including National Pavilions, which have become a hit with visitors. An integral part of the show, the National Pavilions from Japan, Hong Kong-China, India, Italy, Malaysia, Lebanon, Turkey, Thailand, Singapore and China literarily take visitors on a world tour, giving them a sneak peek into some of the finest collection of jewellery creations. Apart from providing visitors an opportunity to buy directly from manufacturers and designers, the show, which had Salem Al Shueibi Jewellery as platinum sponsor, also offered them a chance to win valuable prizes through raffle draws for every purchase of Dhs 500. As in the past, there are incredible prizes awaiting shoppers. A lucky shopper can take home 1 kg of gold in the mega raffle draw on the last day of the event. Besides, all general visitors registering onsite will be entered into a raffle draw for a chance to win an 18k diamond ring. The show is open until 10pm today. Tomorrow, the show is open from 12 noon to 4 pm exclusively for women and for general public from 4 pm to 10 pm. On Thursday, it will be open from 12 noon to 11 pm; while on Friday, it will be open from 3pm to 11 pm. On Saturday, the exhibition opens from 12 noon to 10pm.